An Investment that Lasts a Lifetime! 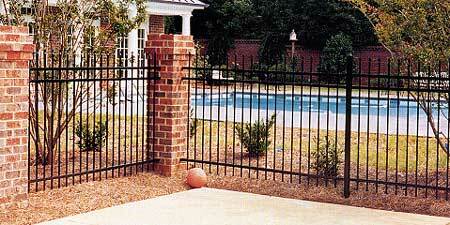 Steel ornamental fencing is the wisest choice you can make in home improvement. It will actually appreciate in value with your home. 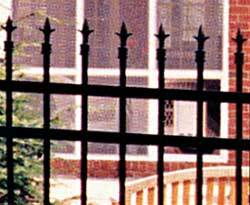 Ornament steel fencing adds beauty to your property in contrast to the institutional look of chain link fencing. 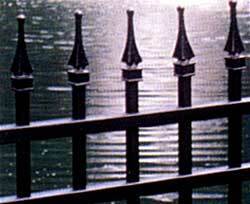 Plus, ornamental steel fencing will last for many more years than wood fencing with virtually no maintenance. 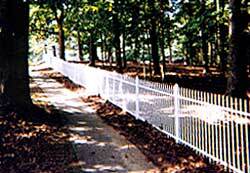 The 2-rail white Classic fence is further complemented with attractive adornments. Adding a third rail gives the traditional Classic fence 50% greater strength. It is ideal when situations require greater fence heights and the fence must withstand heavier vertical loads. Shown here is the 3-rail brown Classic with a special order arched walk gate. The Majestic 2-rail design offers contemporary simplicity with no protruding pickets. 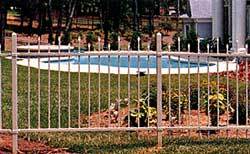 Pool fencing available.Check your local pool code for compliance prior to ordering. Large estates and many condominium complexes are selecting the elegant appeal of the 3-rail Majestic design. Shown with special order arched walk gate. 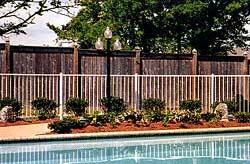 Particularly popular in taller fence heights is the 3-rail Genesis fence as a secure perimeter. This flat top picket comes with a plug-like cap or is subject to the use of Quad Flare or Triad finials for a more custom look. 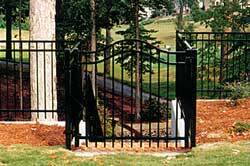 Striking 3-rail black Genesis fence with Triad finials. The look of excellence in a traditional ornamental fence is further enhanced by the alternating picket heights that mark the Warrior design. This style complements landscaping, giving an elegant look to any property line. The 2-rail Warrior in attractive Desert Sand color. Double scepters transform this Classic 2-rail white fence into a unique showpiece.